A Vashikaran Mantra for Cruel Person is used to subdue and remove the hatred, such a person harbors against you and to bring him under your attraction spell. 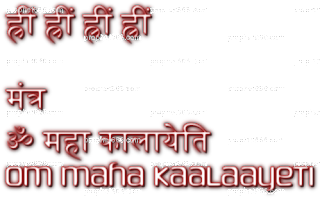 This Sadhana is known as the Kalanaal Mantra Sadhana, said to have originated from Shiva himself. The Sadhana is of a fearsome nature; only for the highly experienced Tantriks. A Yantra has to be prepared on a Bhojpatra by writing the word ह्रीं with Gorochana Paste 4 times as shown in the image. Then mud from the root of any tree has to be collected and a Mud Doll of the Cruel Person you wish to attract has to be prepared from the mud. Then the Yantra has to be fixed on the chest of the Mud Doll. Then the Doll has to be worshiped with the usual offerings of flowers, Dhoop and the lighting of an Oil Lamp. Then on the night of the Chaturdashi of the Krishna Paksha [14th day of the dark fortnight of the Hindu Lunar Month], this Doll along with the Yantra has to be buried in the ground and on the place it is buried a fire has to be lit and Rice has to be cooked on this fire. The blood of a goat has to be mixed in the Rice. Please tell me what to do with the rice cooked on the fire in which we have to add goat's blood, do we need to eat that rice mixed with blood or do we have to offer it in the havan. pls tell me thantrik experts adrees for protection. pranam guruji...i got a little dfclt to understand is it 14th night or 4th night?havan ofering 108time or only time?and when should i make that doll can i make it early in the morning of that day? Sir Chaturdashi is The 14th day of Calender. Chaturthi is the 4th day. Sir, please tell which day it is done on? Thank you. There was a discrepancy in the wordings, which has been corrected. The Vashikaran Sadhana is done on the 14th day, which is Chaturdashi.